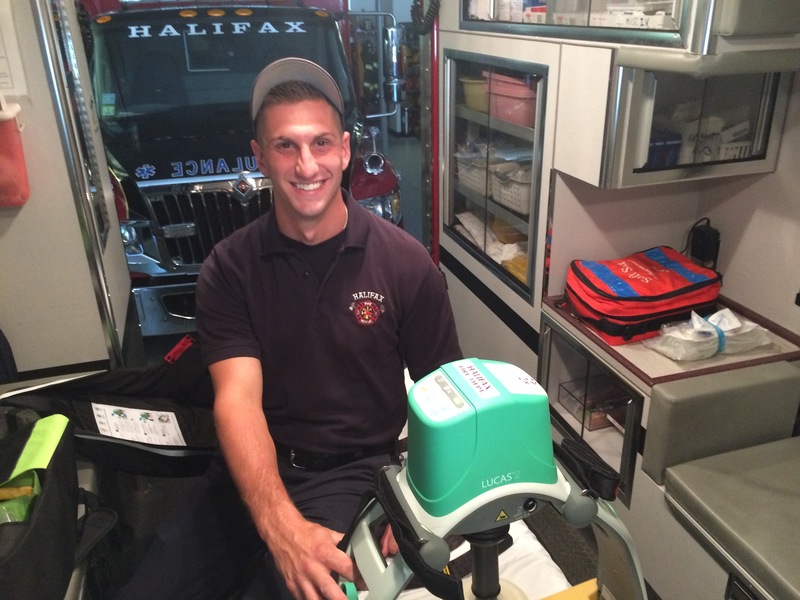 Paramedic Rob Malone is smiling with the new Lucas Automated Chest Compressor which helped him revive a 71-year-old Halifax resident who was found on his back yard in full cardiac arrest. The man is recovering at a local hospital. Photo by Abram Neal. HALIFAX – Halifax Fire Chief Jason Viveiros told the Express this week that his department had performed its first “save” using one of the two Lucas Automated Chest Compressors that his department received through a $24,000 FEMA Assistance to Firefighters Grant this spring. The funds came in about a month ago, Viveiros said, and after equipping both ambulances and training personnel in its use, it wasn’t long before the Lucas machine was put to use. Last Sunday, July 19, first responders were called to assist a 71-year-old man found in his backyard in full cardiac arrest. Firefighter/paramedic Rob Malone quickly bought the patient to the new Lucas Automated Chest Compressor and with its use, was able to revive the man and transport him to the hospital where he remains a patient. It was the first save made with the machine in Halifax. “This is one of those items which we had on a Capital Expenditures plan,” Viveiros said, “but after working with FEMA’s Assistance to Firefighters Grant program, we were able to get the items paid for with federal funding.” The town contributed 5%, or $1,073, according to Viveiros. The Lucas machines were put into service on June 10th. The significance of these machines to an Advanced Life Saving (A.L.S.) fire department is critical. The machine senses the individual patient and performs appropriate compressions without much input from the responder. Once correctly placed, it is ready to go with little more than a push of a button. “With only three buttons, they are very straightforward to setup and use. Especially in the ambulances, they really free up a lot of space to work,” said Malone, who is being credited with the save. The most important aspect of an Automated Chest Compressor is that it frees up an entire emergency worker whose job would be solely to perform chest compressions to do another task. During a call, in the midst of the busyness, the machine is almost the equivalent of an extra person on the scene. Though surely it was, there’s a new team-member at the Halifax Fire Department, and hopefully many more happy stories. When Chief Viveiros told David Paar, Regional Director of the Assistance to Firefighters Grant Program, about the save, Paar responded that he was happy the program was doing what it was intended to do, help firefighters save lives.